Named for the beautiful Red Russia leather hides used to make it, this extra heavy-duty, high-capacity corporate record book is the one Fortune 500 companies use to preserve their most important records. Hand stamped 24K gold tooled record book with hubs on spine. Precision tooled round rod loose leaf binding mechanism. 500 page capacity, can be locked for security. What's included in the Red Russia corporate kit? 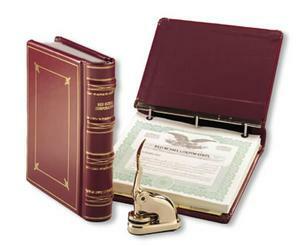 The Red Russia corporate kit includes a brass finished corporate seal, certificates, transfer ledger, index tabs, corporate record tickler, minute paper and optional minutes and bylaws for corporations or operating agreements for LLC's, all neatly stored in a beautiful leather binder with the company name hand stamped in gold on the spine.